Heartland Virus Found In 13 States : Shots - Health News The Heartland virus was considered rare. Scientists now say they've found signs of it circulating in animals across the Midwest, New England and the South. They think human cases have been missed. Scientists think the lone star tick (center) likely transmits Heartland disease to people. And the virus probably also circulates in deer and coyotes. It's called the Heartland virus disease. Since it was first detected in 2009, there have been only nine reported cases in the Midwest, including two deaths. 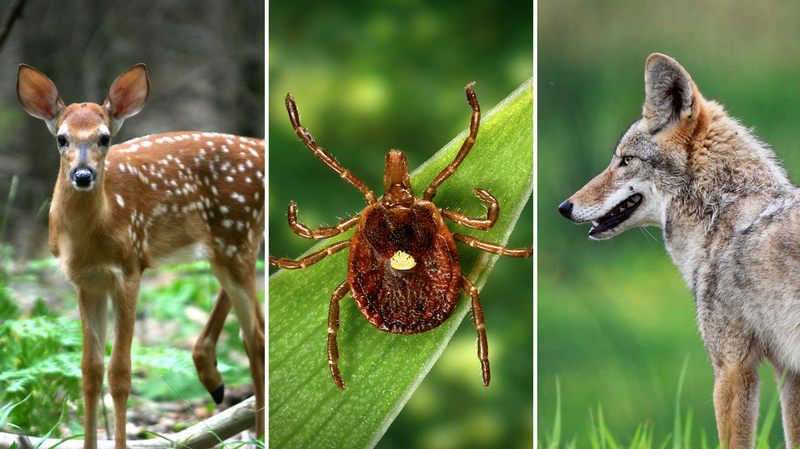 A team at the Centers for Disease Control and Prevention has now found signs that Heartland virus is circulating in deer, raccoons, coyotes and moose in 13 states — from Texas to North Carolina and Florida to Maine. "It was not only in these states, but it was fairly common," says biologist Nick Komar, who led the study. "It's very possible there have been many other cases that have been overlooked." The Heartland virus causes symptoms similar to other diseases, including high fever, nausea, joint pain and severe bruising. "Unless doctors are doing laboratory tests specifically for this infection, they'll miss it," Komar says. "This study is a way to get the word out, so the medical establishment knows there may be more infections out there. And people should be watching for it." Komar and his colleague looked for signs of previous Heartland infections in about 1,400 animals in 17 states. About 100 animals tested positive for Heartland antibodies, Komar and his colleague report Wednesday in the journal Emerging Infectious Diseases. Since the study didn't directly detect the Heartland virus in the animals, there's a small chance another virus very similar to Heartland is circulating in some states, Komar says. "The underlying message of this story is there are new pathogens out there," he says. "Our society is changing so quickly — and even the climate — that it allows for new things to develop. And we have to be on the lookout for those new things so we can protect the public health." Scientists thought the lone star tick was the primary way Heartland spreads. But that tick isn't found up in northern New England. So there's likely a second type of tick that can also carry Heartland.